chocolate freebies Lindt Lindor chocolate printable Target Tops Tops Markets Walmart Wegmans FREE Lindt LINDOR Truffles w/ Coupon at most stores! 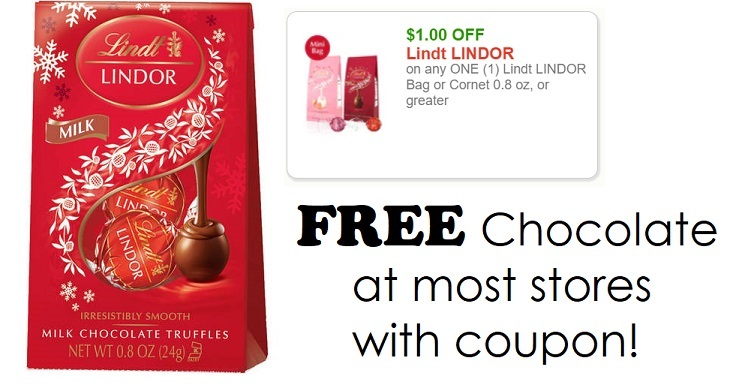 FREE Lindt LINDOR Truffles w/ Coupon at most stores! What a nice morning! We have a bunch of new coupons to print today. Of course I was super excited about the one that makes for FREE chocolate! Grab this $1/1 Lindt Lindor coupon while you can as I'm sure it won't last long. It makes for FREE mini bags of truffles at most any store that sells them! The drugstores probably sell these as well, especially with Valentine's Day coming up (Walgreens has been confirmed to have them and you can even clip a digital coupon to get a 3rd bag free)!